I came across this piece of technology at Cnet while looking for a subwoofer to replace my pc speaker system. This is a new and unique design of subwoofer called Rotary Woofer. 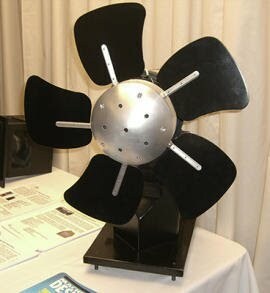 Rotary woofers looks just like a fan and works just like a fan (spinning blades). The Rotary Woofer is a subwoofer-style loudspeaker which reproduces very low frequency content by using a conventional speaker voice coil's motion to change the pitch of a set of fan blades rotating at a constant speed. The pitch of the fan blades varies in exact relation to the voltage (audio signal) presented to the voice coil, and the fan blade pitch is able to swing both positive and negative, with respect to a zero pitch spinning blade position. Check rotarywoofer.com for a simpler explanation on how this device works (how fan blades produces bass) based on layman's terms. According to Cnet the TRW 17 can generate bass down to 1hz (for comparison purposes, standard $1,000 subs poop out in the 30Hz range, and ultra high-end subs rarely make it below 18Hz) which makes this loudspeaker very powerful. The rotary woofer represents a new and much more efficient way to move air at low frequencies.